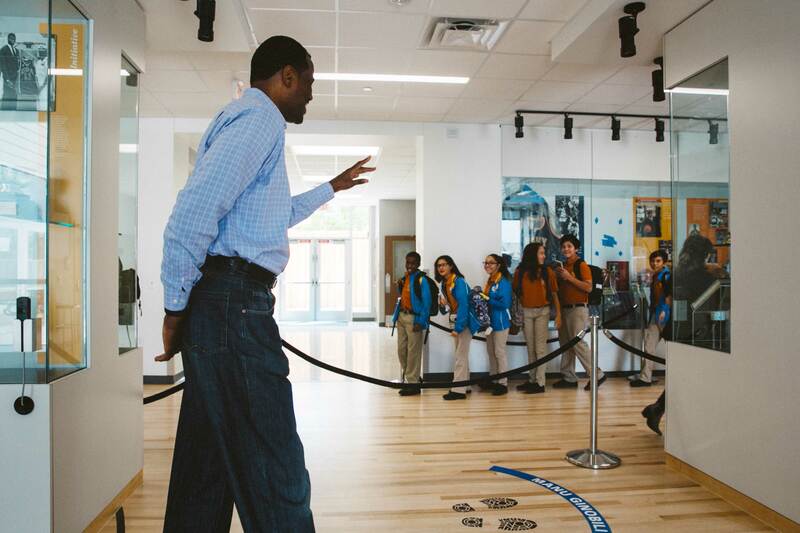 SAN ANTONIO — The students making their way through a first-floor corridor at Carver Academy and College Prep grew wide-eyed when they bumped into the school’s founder. A few gasped when the still-trim, 7-foot-1 Spurs legend David Robinson stopped to wave, and they beamed when he posed for a few selfies. Most of these young people were not yet born when Robinson’s Hall of Fame NBA career ended in 2003. But, to them, the man nicknamed “the Admiral” is as much a star for what he has done off the court as for what he did on it. Robinson launched what was then called Carver Academy 16 years ago with $10 million of his own money. It began as a small parochial school serving elementary students, but it is now a publicly funded charter school that enrolls more than 1,100 pupils. Most of the students are Hispanic or black, and most of them are from low-income families. Nearly all of them are on track for college, school officials say. We’re in an age when athletes are embracing social activism in a way that rivals anything in the past. Following the lead of former San Francisco 49ers quarterback Colin Kaepernick, scores of NFL players have stirred a national debate by taking a knee or sitting during the national anthem to call attention to police brutality and racial injustice. Others have worn T-shirts or hoodies to protest the deaths of Eric Garner or Trayvon Martin. Many athletes have started foundations or otherwise tried to leverage their wealth and fame to spur social change. It is a level of consciousness that heartens the 52-year-old Robinson. And while Robinson is careful not to criticize any protesting players, he says it remains to be seen whether their strong words will be matched by meaningful deeds — or make the kind of difference that is happening at Carver. It is something Robinson knows firsthand. It took him years to turn his dream of a school into reality. He says the athletes eager to make change should be prepared for a similar struggle. Robinson’s patient brand of activism led him to not only open a school but to also co-found Admiral Capital Group, a private equity firm that helps pay for his good deeds. Admiral controls more than $1 billion in office space, hotels and apartment developments. The company also has invested alongside several NBA and NFL team owners in an online platform that helps coaches at all levels break down game film as well as a separate online platform that automates management of youth athletic leagues. The firm sets aside 10 percent of its profits for donations aimed at making social change. Admiral has also helped guide investments by other professional athletes, including Spurs guard Tony Parker, former NFL defensive lineman Justin Tuck (who served an internship with the firm as an MBA student) and retired major league outfielder Torii Hunter. Not only are the investors immersed in the details of their investments, but they also receive advice on how to make lasting social change. For instance, each year the firm hires 25 Houston-area high school students to work in a Hilton Garden Inn hotel it owns there. The idea is to expose young people to careers in the hospitality industry. If students take to the work, they are given scholarships to the University of Houston, which they attend as Admiral scholars. Robinson’s vision for social activism came into focus three decades ago during a two-year military commitment after his graduation from the Naval Academy. During that time, Robinson visited a couple of dozen Washington, D.C.-area high schools to deliver a simple message: Just say no to drugs. Most students seemed thrilled to have the basketball star in their midst. Still, Robinson’s words frequently fell flat, particularly with the students who most needed to hear them. He realized he had to do more than say something. He had to do something. Robinson, a devout Christian, prayed on it. The answer he got convinced him that he should one day open a school to help guide young people to make better choices, regardless of the difficult circumstances they may confront. Robinson nurtured his dream for most of his NBA career, making donations and connections and learning what he could about educational policy. Finally, he made his move, opening Carver Academy in 2001, two years before he retired from basketball. As a parochial school, it had just 120 students. To expand its reach and relieve the constant fundraising pressure, Robinson agreed in 2012 to convert Carver into a publicly funded charter school by joining forces with IDEA, a nonprofit that operates 61 schools serving 36,000 students across Texas. Robinson is now a member of IDEA’s San Antonio regional board. 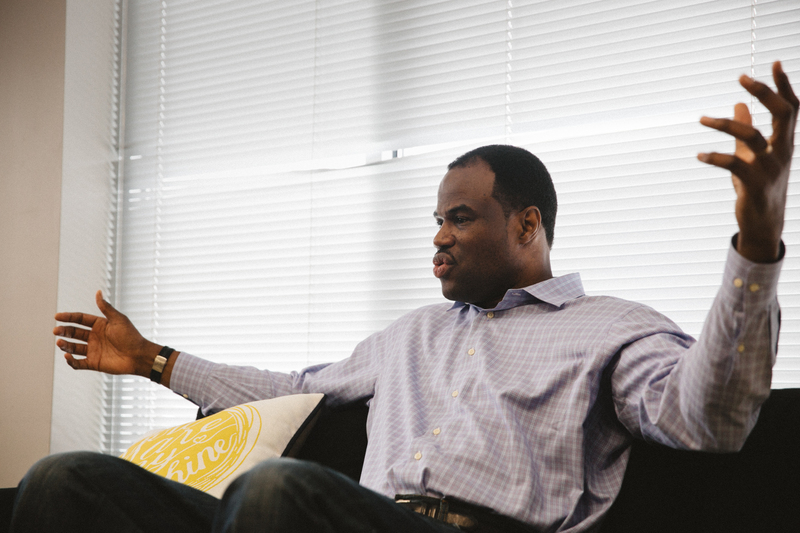 David Robinson originally founded George W. Carver Academy in 2001. Eleven years later, he partnered with IDEA Public Schools to expand his goal of accessible quality education for all children. One of Robinson’s core beliefs is that tough circumstances should not be seen as insurmountable obstacles to achievement. He named the school after George Washington Carver, who was born into slavery but nonetheless went on to become a widely respected botanist, inventor and teacher. He thought Carver’s life story contained a lesson for young people today. Robinson says another one of his core strategies is to inspire young people to tap into their own gifts and leverage whatever opportunities they have. Too often, Robinson said, schools that serve low-income students succumb to the instability and low expectations that often accompany poverty. It is a problem identified by many educators but one Carver has apparently found a way to conquer. Its elementary school students consistently score near the 70th percentile on standardized math and reading tests, an achievement that officials attribute to their individualized focus on the students. Parents have responded: This year the school could enroll just 120 new students out of 300 who applied through a lottery. High expectations and individually tailored instruction help. But it is also helpful that one of San Antonio’s best-known celebrities is a regular presence at Carver. The first floor of the upper school has a small museum dedicated to Robinson, a two-time NBA champion, 10-time All Star and former league MVP. There are jerseys from the Naval Academy, the Spurs and the two U.S. Olympic teams he played for. There are also medals and trophies, and even a small section of basketball floor marked with the footprints of Robinson and some of his former teammates and coaches. Robinson says that is where many people who command the spotlight can be helpful. Robinson applauded stars such as LeBron James, Chris Paul and others who have backed up their calls for social justice by donating millions of dollars for things such as after-school programs and college scholarships. As he watches more athletes find their voice embracing the new civil rights movement, he said he will be dividing them into two categories: those who just say things, and those who back their words with action.